As you may know from my previous posts, a couple weeks ago we undertook a road trip along the Southeastern part of the Atlantic Coast to learn more about the history, architecture, and – of course! – vegan food of the region. 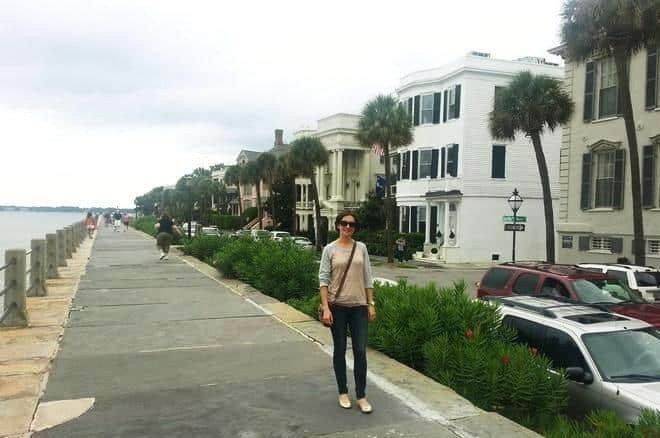 Today I’m going to tell you about the wonderful city of Charleston, South Carolina, where we stayed for a couple days. We enjoyed exploring the historic downtown, took a ferry ride to Fort Sumter, and had delicious meals at vegan-friendly eateries Five Loaves Café and Dell’z Deli. 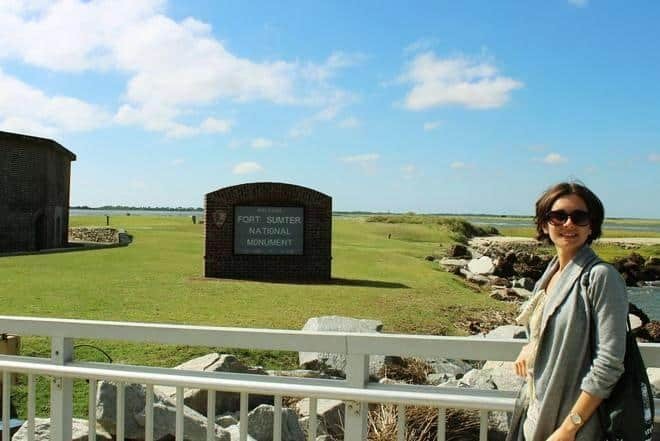 You can read my first post about our journey (Amelia Island, Fla., and Jekyll Island, Ga.) as well as my second post (Savannah, Ga.) by clicking on these highlighted links. Charleston, SC was founded in 1670 and was originally called Charles Towne after the British king Charles II (the current name was adopted in 1783). The city is located on Charleston Harbor at the point where Ashley and Cooper rivers flow into the Atlantic Ocean. The sky was overcast the day we arrived, but the following day there was no shortage of sun! I was glad, however, that the weather never go too hot: according to the locals, that was the first week of lower temperatures in September. 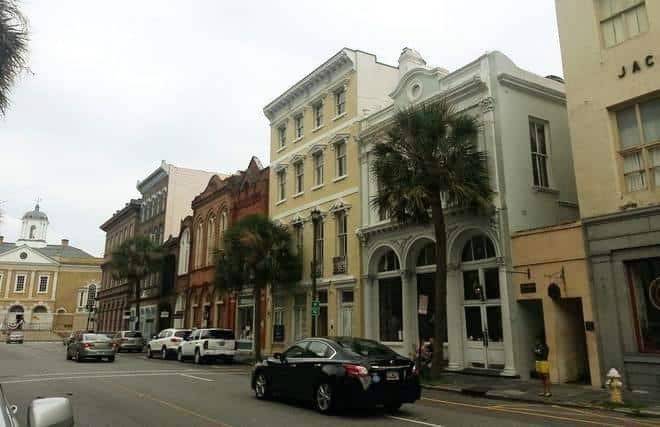 The historic downtown area is very well preserved: the architecture of numerous buildings can bring your imagination straight to the olden times, when Charleston was considered one of the richest cities in America. Broad Street divides the downtown area into what’s known as ‘South of Broad’ and ‘North of Broad’. I got the impression that ‘South of Broad’ was cooler than ‘North’, although both parts were gorgeous. 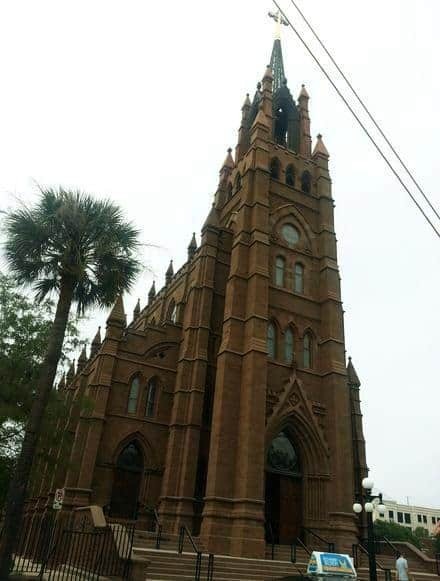 One of Charleston’s nicknames is Holy City, perhaps because of a large number of churches in the downtown area. Historically, Carolina was one of the colonies that provided tolerance to all Protestant religions as well as Judaism, but it didn’t welcome Roman Catholics for a long time. Eventually, it warmed up to Catholicism, and now we can enjoy the architecture of multiple churches all over the city. 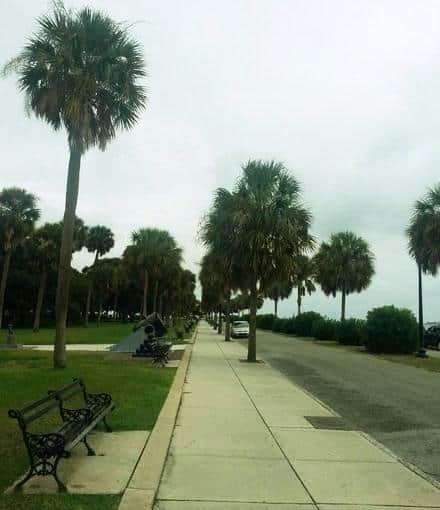 The Battery Park at the southernmost tip of Charleston peninsula is a lovely place to walk around. The park has lots of classic Southern live oak trees as well as palmetto trees (the state trees of South Carolina). Multiple cannons are arranged along the perimeter of the park to remind us of the city’s history. 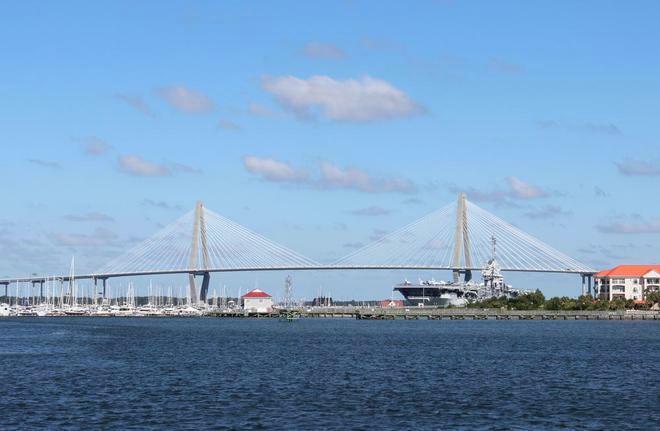 Charlestonians get to enjoy this beautiful view of Arthur Ravenel Jr. Bridge every day from the eastern part of Charleston peninsula. On our second day, we took a ferry to visit Fort Sumter – a historic fort located in Charleston Harbor. 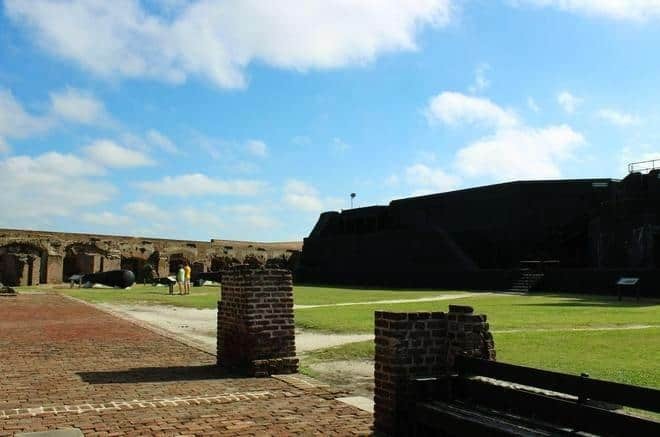 The fort is best known for being the site of the first shots that started the Civil War in 1861. These days, nearly 300 thousand people visit the fort built on an artificial island every year. The ferry trip lasted about 45 min one way. We were dropped off at the fort for an hour, and then shuttled back to Charleston by the same ferry. The location in the harbor was chosen for the fort so that it could provide protection from possible intruders from the sea. Nearly 70 thousand tons of granite were imported from New England to form an artificial sandbar that the fort is built on. 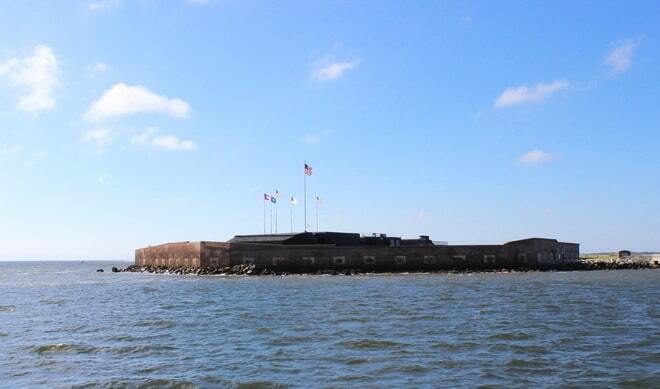 The construction of Fort Sumter began in 1829, but it was still unfinished by the time the Civil War began. We listened to a very informative talk about the fort’s history when we arrived, and then took a walk around the premises. Overall, we were very pleased with our trip to Fort Sumter, and I would recommend visiting the fort to anyone who’s traveling to Charleston. To learn more about the fort’s history, follow this link. Out of all the restaurants we ate at in Charleston, two impressed me the most. The first one, Five Loaves Café, wasn’t fully vegetarian or vegan, but it had a few good dinner options. Vegetarian will be very pleased with all the offerings, and as for us the cheese-free people, most dishes can be made without the cheese on top. I had the risotto of the day, which was made with coconut milk, tofu, and vegetables. Rob had homemade fettuccine with tomato sauce and eggplant. All in all, the meal was delicious! The second restaurant that impressed me was Dell’z Deli. Now that’s a place that I wish I had in my neighborhood open 24/7! We arrived just as the lunch rush started, and the tiny room was beginning to get packed with people who had called in their order over the phone or just walked in like us. There were only two people working – a guy making all the food and a girl handling the orders over the phone and in person – and boy did they work hard! I would have gotten terribly stressed under the pressure of having to make so much food really fast, but they were very cool and smiling the whole time. Maudell “Dell” Grayson opened Dell’z Deli in April 2010 with a wish to fulfill her dream of making good food for the people of Charleston. 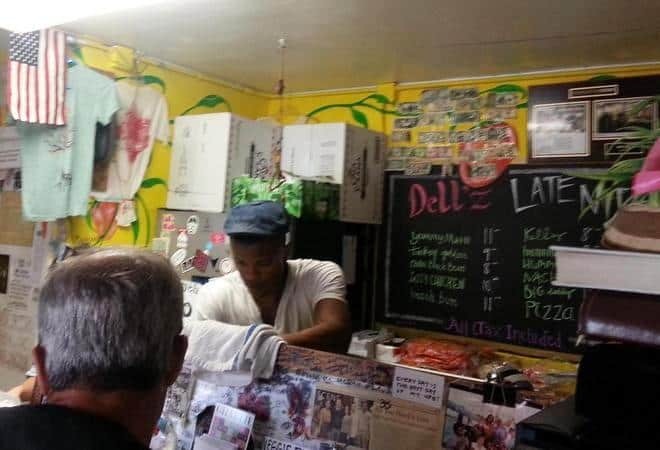 Thanks to the ever-growing support of the locals, Dell’z family of eateries has expanded to include two more locations – Dell’z Uptown, a full-service restaurant, and Dell’z Vibes, a juice and smoothie bar run by Dell’s daughter, Nicole. I wish we had time to visit the other two locations, but we were heading out of Charleston right after we were done with our lunch! Since the place was very busy, we had to wait for our food for about 20 min, but we had no problem with that – more time to take in the good vibes! Once the food was done, we went outside and devoured it sitting on the steps of some nearby house. The food was so good that I hardly had time to take a quick picture of my wrap! 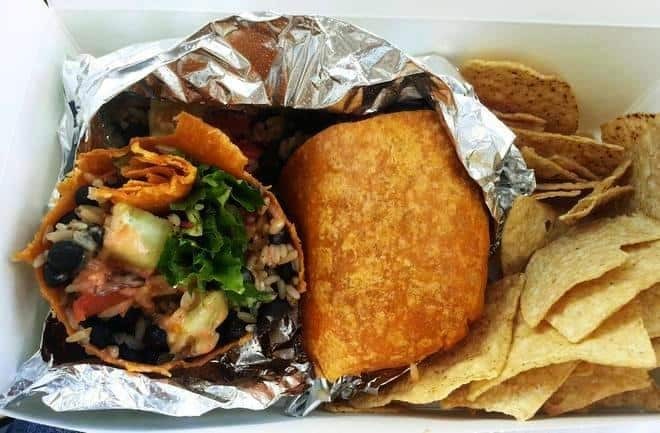 Pictured above: my black bean and rice wrap with tortilla chips. Rob had a ‘Fake Chicken Wrap’. Both were just what the doctor ordered! If you find yourself in Charleston, definitely check out all of Dell’z eateries and don’t skimp on their signature Goddess dressing! Okay, time to wrap up my tale of Charleston – all of this food talk is making me hungry! Anyway, that’s it for our road trip reports! 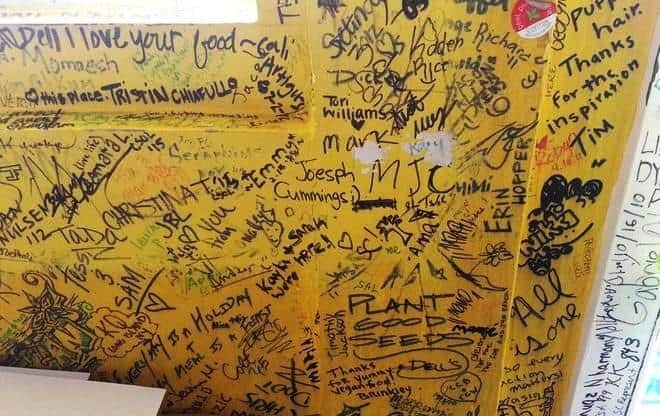 Hope you got a good idea of what it’s like to travel and eat vegan along the Atlantic coast of Florida, Georgia, and South Carolina! Click on the highlighted links to see my reports on Amelia Island, Fla., Jekyll Island, Ga., and Savannah, Ga.
Week 5 of Marathon Training. Also: Our Adventures at the Alligator Farm in Summerdale, AL! Tagged black beans, history, traveling, vegan. Bookmark the permalink.